Securely store and share your sensitive business files with confidence. Your file sharing security is our number one priority. With Onehub’s secure cloud storage and backup features, your data is safe from physical or infrastructure failures. Your data is stored and backed up across multiple devices and multiple facilities. Our system regularly checks the data for integrity and, if any flaws are found, repairs are implemented automatically. Onehub uses the same 256-bit encryption and physical security policies as banks for the most secure cloud storage experience. We employ multiple methods of keeping your data secure both in transit and at rest. Using SSL, every communication is sent over a secure, encrypted connection. Our service is monitored 24/7, and our practices are verified by VeriSign. Onehub automatically creates encrypted backups of your data using 256-bit encryption. With multiple redundancies and regular integrity assessments using checksums, if any flaws are found, the system automatically repairs them using redundant data. Have no doubt in your file sharing security. Onehub maintains security protocols in place for organizations to remain HIPAA compliant. Through our relationship with Amazon Web Services, Onehub data is stored with SSAE 16 certification and PCI DSS Level 1. Additionally, we encrypt data in transit and at rest, enable a complete audit trail, and provide granular role-based permissions. Onehub's secure cloud storage platform provides direct, easy-to-use tools to control the view, print, and download privileges of your documents. Anything a user does is tracked and can be audited. 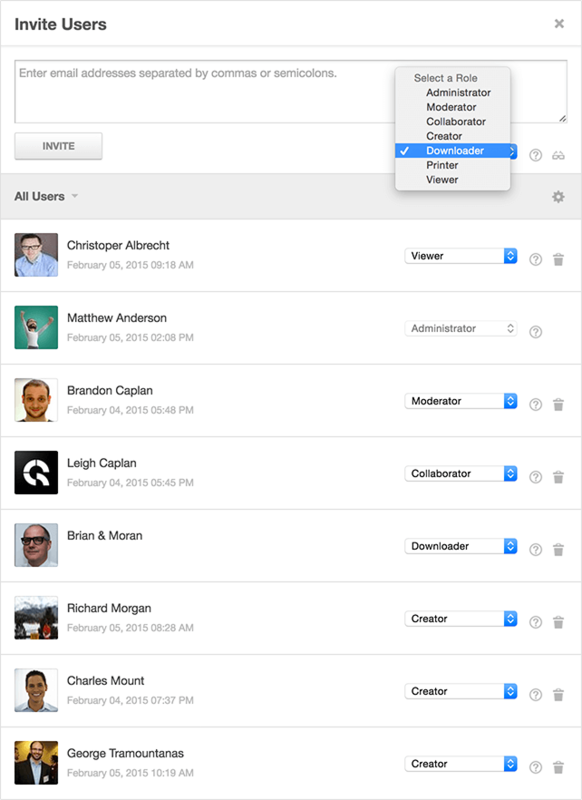 Get notified when someone accesses Workspaces, views a preview, downloads a file, or prints a document. Audit trails for your files brings peace of mind and helps maintain compliance. Provide customized agreements users must accept before accessing content to further ensure your file sharing security. Use a default agreement or customize with your own necessary language. Protect your property with Onehub’s automatic watermarking tools. When activated, the words CONFIDENTIAL, the viewing user’s email address, and the current date will appear across the document. For guest users accessing the file via a secure link, their IP address will be shown instead of an email address. 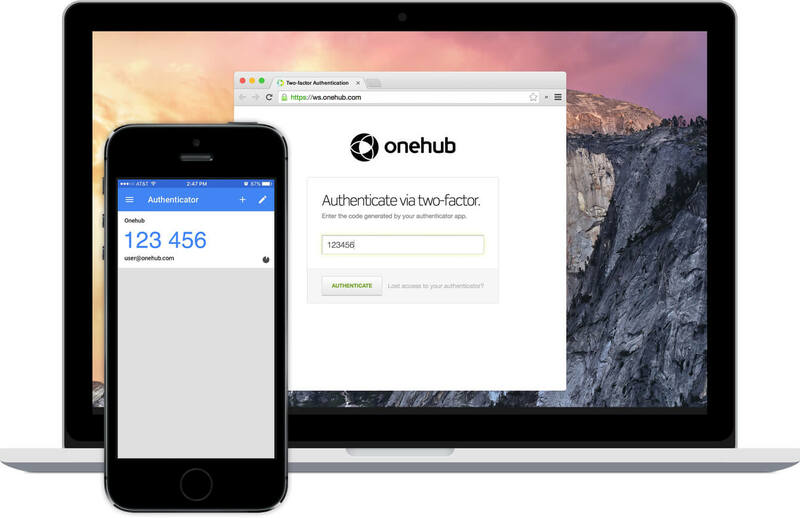 Increase your file sharing security by requiring a special code, delivered via verified mobile device, when signing into Onehub. Business and Enterprise plans can enforce two-factor authentication across the entire account for stress-free, secure cloud storage. Workspace features specifically designed to enhance security. Whether working with small local businesses or large global enterprises, maintaining the highest level of security for your data is imperative. 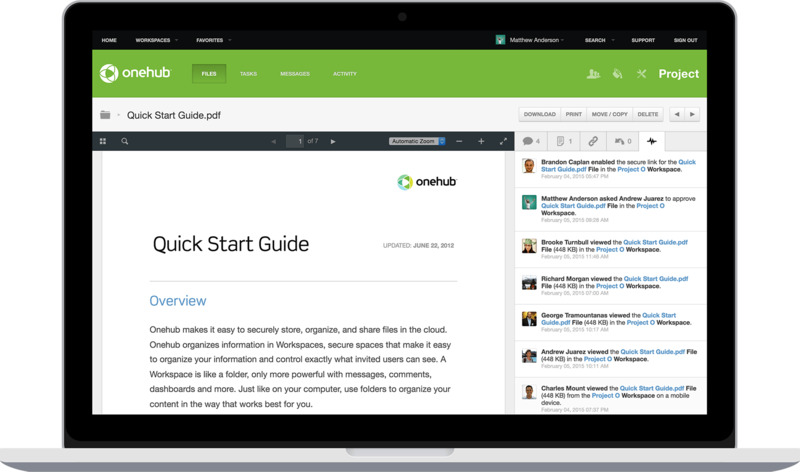 Feel completely confident in your secure cloud storage platform by selecting Onehub. Turn any Workspace into a virtual data room, ratcheting up file sharing security and augmenting your ability to partition access to files. Virtual data rooms are your most secure cloud storage option. File management is easier and your data more secure with automatic file deletion. Make your content ephemeral, enabling you to completely trust the file sharing security of your Workspaces. Require complex user passwords, increasing file sharing security. Additionally, administrators can require that passwords be changed on a periodic basis to help maintain the integrity of your secure cloud storage platform. We do everything in our power to keep our customers safe from the latest threats. If you are aware of a security flaw that you believe might impact our products, we want to know about it. Please email any and all relevant information to security@onehub.com. We strongly recommend that you encrypt your email with our public key. We will acknowledge your report within 24 hours and continue to communicate with you as we fix any issues. Once the issue has been patched and deployed, we will disclose the issue via email and/or blog post. Being able to limit Onehub’s functions to certain users or files helps us keep things private or make them public as we need.